I think it is necessary to first explain that I hate space movies. They’re always terrifying and always end with people dying and are always way too intense without enough good emotional pay-off for me to enjoy them. That being said, “The Martian” was my choice for a review this week. Based on the novel by Andy Weir, “The Martian” takes you through the struggles and successes of trying to get astronaut Mark Watney (Matt Damon) back to earth after being mistakenly stranded on Mars. One of my biggest gripes with the film comes simply from this premise. The movie gives you no preamble for how we suddenly started sending people to Mars. Not only that, this is the fourth time we’ve done it. Despite this, our technology doesn’t seem to have progressed much. In fact, the technology used throughout the film makes it look like it is happening in present day, except suddenly we have this ability to have people live on Mars. An explanation of this aspect of the film would have hopefully created a more realistic set-up for the film. Despite my previous complaint, Matt Damon, paired with the clever screenplay writing of Drew Goddard, made for a fun movie to watch. My biggest kudos for “The Martian” comes in its sense of humor. Although this movie takes a serious tone, it pulls off a light hearted approach . From Watney’s humorous banter with the various cameras set-up on base, to the disco themed soundtrack of the film, the ‘good’ moments will be great. You will feel happy when this movie wants you to. The ever-impending chance of death is not jammed down your throat for the entire movie. All of the acting in the movie is equally enjoyable. Some of the best moments in the film are just watching dozens of realistically humorous characters. The humor was rarely misplaced and was always well executed. It’s also during these moments that the simplicity of the special effects will take hold of you. There was only one moment in the entire movie that I was taken out of the experience of watching by a visual on the screen. Everything looks great and realistic. 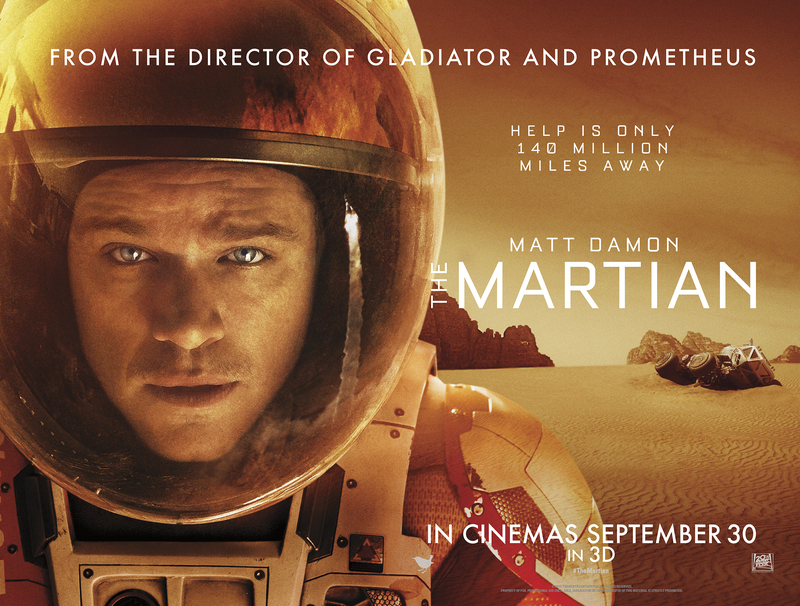 Director Ridley Scott did not take this movie as an opportunity to CGI the crap out of Mars. It was simple and effective. Despite all of these great bits, it was still a space movie. For some reason, ever- impending doom while you’re just sitting there isn’t very appealing to me. It just has a tendency to make movies way more tense than need be. Simple moments where he would simply be walking from one end of the spaceship to the next, it would suddenly become obnoxiously tense. Yes, it helps build the intensity of the moment and makes the whole thing more dramatic, but it’s the kind of drama that makes you want to roll your eyes. Overall, I would say this is a good movie. Heck, I might even say it’s a great movie! If you’re not into space movies, like me, I’d say give this one a go anyways. It’s a good ride.